As in any other segment of society, there are good bikers and there are bad bikers. This is the case whether you're hanging with motorcycle club members, or at a bar in San Clemente, or a coffee shop in Silverlake. Bad behavior by bikers is the exception, not the norm. Nonetheless the media and law enforcement jump all over it when it happens. For this reason, the bloggers at Riderz Law don't like to focus on the mostly isolated incidents by rogue (or just plain jerky) motorcyclists. And then I read a story online about a motorcycle ride in St. Louis that makes me cringe. The annual event is called the "Ride of the Century." First of all, could someone explain to the organizers of this thing that calling an event that takes place every year "the ride of the CENTURY" is an oxymoron? But that, of course, is hardly my issue with it. I have not been to this thing, but as far as I can tell, this is a convergence of sport bike riding motorcyclists doing their best to harass and annoy the public at large. According to the organizer's Facebook page, "Ride of the Century presented by Streetfighterz.com out of STL call riders from across the country to converge on the streets of STL for a few days of street bike mayhem." The event does not seem to have any greater purpose but mayhem and irresponsible riding. it's not remembering vets, or 9/11, and as far as I can tell, it's not raising money any kind of charity. Look, I am not a hater of sport bikes. I've owned a few myself, and I look forward to getting adding a Ducati next spring from my friends at Ducati Newport Beach. But regardless of what we're riding, going out en masse with the intent to cause trouble is bad for bikers everywhere. It leads to laws restricted what we can do, where we can ride, how we must dress, helmet laws, law enforcement targeting bikers, and on and on and on. 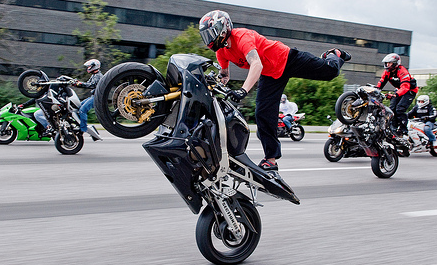 And on a personal note, this kind of organized enthusiasm for stunt riding on freeways makes my stomach turn. As a motorcycle accident lawyer, every day I see tragic accidents and lives lost by careless and over-aggressive riding. And it's often by youthful riders who haven't been riding for more than a year or two, and who haven't even received proper rider training. I know that careless riding will happen. I know that knuckleheads will do wheelies and tricks on the freeways San Diego to San Francisco, and everywhere in between. I know that stupidity is part of every walk of life. But I can't get behind an organized ride which encourages this kind of idiocy. I know a lot of my readers will disagree, and I'm expected plenty of any responses. But when you've seen what I've seen, and been riding and practicing motorcycle accident law as long as I have, I can't help but think you would adamantly agree. Ride smart, ride alert, ride safe.